Location: Frances Walker-Slocum Papers, Record Group 30/22, Box 1, O. C. A. 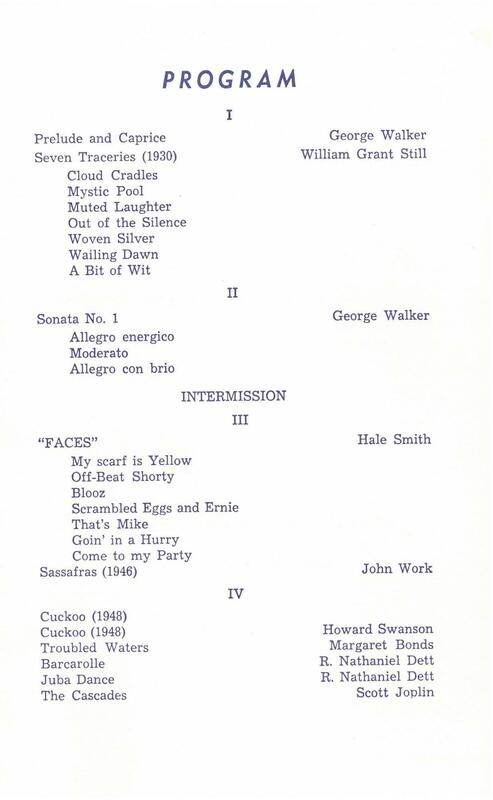 After Frances Walker-Slocum won acclaim from the New York Times for recitals at Carnegie Hall, Alice Tully Hall, and the National Gallery of Art in Washington, D. C., she performed this program, almost identical to the Bicentennial (See Document 1), at Oakwood College, a historically Black college. 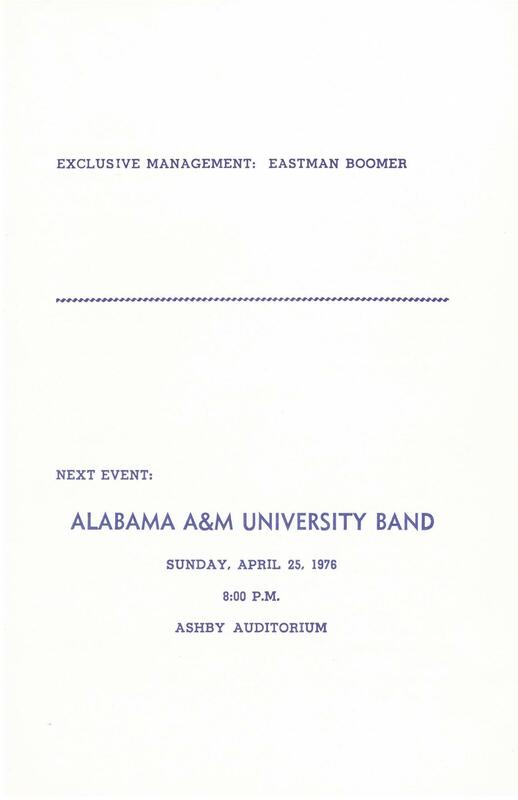 Many of the works performed during this program remained in her repertoire during her Oberlin years. 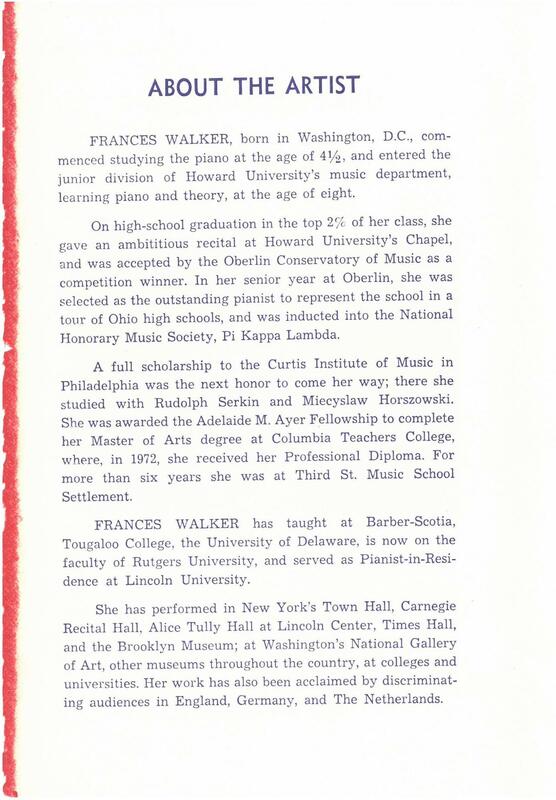 FRANCES WALKER, born in Washington, D.C., commenced studying the piano at the age of 4 1/2, and entered the junior division of Howard University’s music department, learning piano and theory, at the age of eight. On high-school [sic] graduation in the top 2% of her class, she gave an ambitious recital at Howard University’s Chapel, and was accepted by the Oberlin Conservatory of Music as a competition winner. In her senior year at Oberlin, she was selected as the outstanding pianist to represent the school in a tour of Ohio high schools, and was inducted into the National Honorary Music Society, Pi Kappa Lambda. A full scholarship to the Curtis Institute of Music in Philadelphia was the next honor to come her way; there she studied with Rudolph [Rudolf] Serkin and Miecyslaw [Mieczyslaw] Horszowski. She was awarded the Adelaide M. Ayer Fellowship to complete her Master of Arts degree at Columbia Teachers College, where, in 1972, she received her Professional Diploma. For more than six years she was at Third St. Music School Settlement. 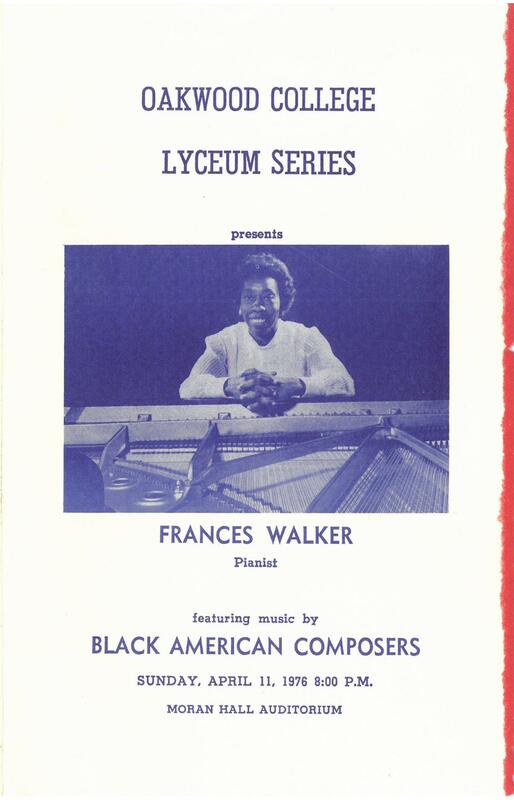 FRANCES WALKER [sic] has taught at Barber-Scotia, Tougaloo College, the University of Delaware, is now on the faculty of Rutgers University, and served as Pianist-in-Residence at Lincoln University. She has performed in New York’s Town Hall, Carnegie Recital Hall, Alice Tully Hall at Lincoln Center, Times Hall and the Brooklyn Museum; at Washington’s National Gallery of Art, other museums throughout the country, at colleges and universities. Her work has also been acclaimed by discriminating audiences in England, Germany, and The Netherlands. George Walker, Source, accessed 18 July 2016. Howard University is a historically Black college. Emilie Wagner founded Third Street Music School Settlement in 1894 as a part of the settlement house movement, which aligned with Progressive First Wave feminism. She provided “high quality music instruction … and social services to the immigrant population of the Lower East Side” (“History and Heritage,” Third Street Music School Settlement, accessed 28 July 2016, Source). Barber-Scotia College is a historically Black college. Tougaloo College is a historically Black college where both Frances Walker-Slocum and Chet Slocum taught. They met here, then left for New York City to marry (Frances Walker-Slocum, A Miraculous Life (Bloomington, Indiana: AuthorHouse, 2006). “Seven Traceries” is one of two published recordings made throughout her career. She recorded with Orion Records, a respected classical label (Programs of Non-Oberlin Recitals, Frances Walker-Slocum Papers, RG 30/222, Box 1, O. C. A.). This piece was Walker’s first significant composition, which he wrote in 1946 (George Theophilus Walker, Oxford Music Online, Source, accessed 15 July 2016).